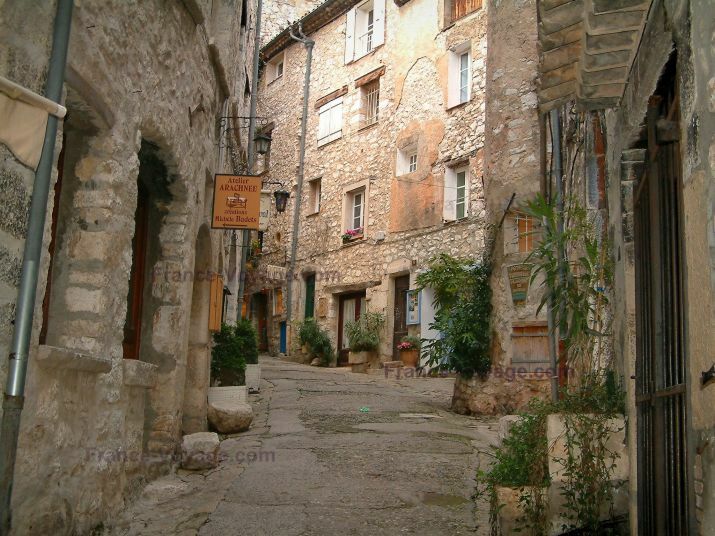 Ménerbes also ranks as one of the most beautiful villages in France. This medieval stone village is perched at the top of a ridge with outstanding views of the Luberon and overlooks the cherry orchards and vineyards in the surrounding valley. 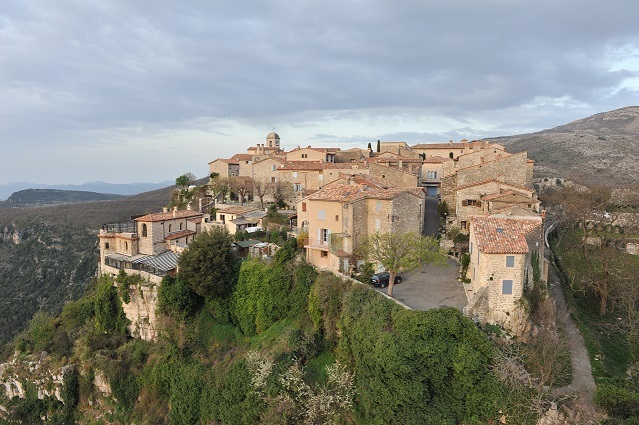 Menerbes has now returned to is origins as a quaint and quiet village, after the onslaught of visitors that came to the village following Peter Mayle’s book ‘A Year in Provence’. The village streets are lined with 16th and 17th century architecture, including the Citadelle, a 16th century miniature fortress, and the chateau du Castellet. The Maison de la Truffe et du Vin is located in the Place de l’Horloge at the top of Menerbes in a beautifully restored mansion, where you can learn out all about truffles and taste the excellent Côtes du Luberon wines. Wine appreciation courses are offered in the summer. Menerbes has several shops, cafes and restaurants, and a market on Thursday mornings. We enjoyed a fabulous lunch on the sunny terrace at Le Galoubet. The vegetable quiche (tarte du jour) was excellent, and was served with a delicious side salad. 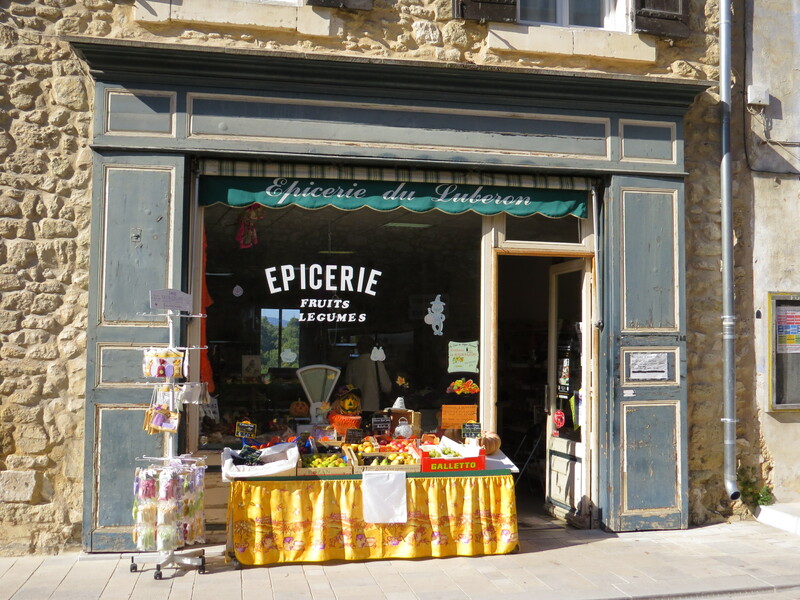 This entry was posted in Activitites, Food & Wine, Villages & towns and tagged Luberon, markets in Provence, Provence, Provence villages on November 3, 2014 by franceboundblog. We love Aix en Provence, and coming back is like returning to our French home. We lived here several years ago with our sons, and we return regularly to visit our favourite city, our friends and neighbours, and to check out places for clients. Whenever we return, the first thing we do is go to the Place de Mairie to touch the golden stones of the arch under the beautiful horloge clock tower, which we used to pass through every morning on our way to French classes at the Universite. 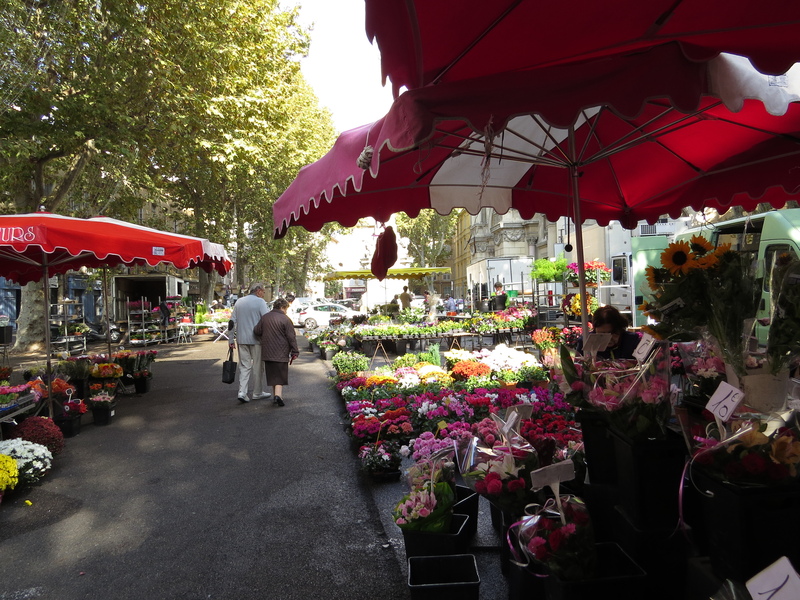 We love the markets, and the sunny squares filled with outdoor cafes, and the tree lined main boulevard Cours Mirabeau, where you can sit back and enjoy the sunshine while watching all the activity of daily life in France. There is a market every day in Aix en Provence. On Tuesday, Thursday and Saturday there is a large market with crafts, collectibles and food at the Place Verdun and Place Precheurs in front of the Palais Justice, and a flower market at the Place Hotel de Ville. A daily farmer’s market with food and fresh produce is held in the Place Richelme between the post office and the old grain market. There is also a clothing and textile market on the Cours Mirabeau on Tuesday and Thursday, and at the Palais Justice on Saturday. On Sundays, there is a brocante/antique market on the Cours Mirabeau. Aix has a wonderful climate and is usually bathed in sunshine illuminating and warming the honey coloured stone buildings. The elegance of Aix-en-Provence can be seen everywhere in its lively streets and squares, historic architecture, and ancient fountains. The Cours Mirabeau is the beautiful tree lined avenue leading from the grand La Rotunde fountain to the statue of Roi Rene, and it is flanked with wide promenades, noble 17 & 18th century buildings, and lively cafes. The old town of Aix is filled with beautiful architecture, shops, markets, museums, and fountains. Aix has the third-largest collection of Baroque architecture in France, after Paris and Versailles. Everywhere, throughout the town, you will find fountains that gave this city its original Roman name of Aquae Sextiae. 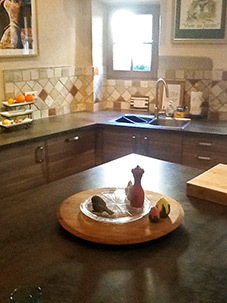 On this visit to Aix en Provence, we are staying at a spacious & stylish one bedroom apartment in the centre of town. The apartment features tasteful furnishings and decor, and a south facing balcony overlooking a private garden below and over the tile rooftops. 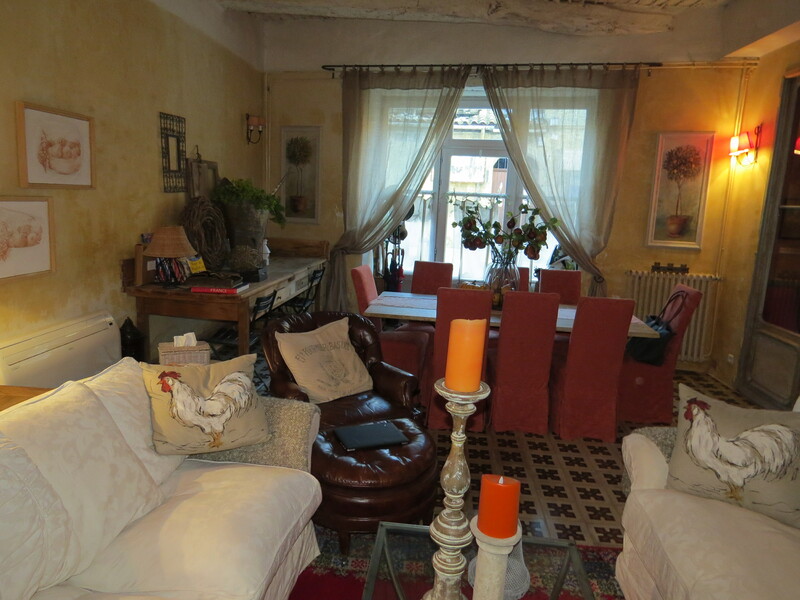 The apartment is quiet and tranquil, even though it is situated in the centre of town. The Cours Mirabeau and all the shops, cafes and restaurants in the historic centre are just a short stroll from the apartment. Access to/from the autoroute is easy, and there is a convenient public parking garage just across the street. Our apartment hostess is very friendly and helpful, and the apartment is equipped with all amenities, good quality linens & towels, and thoughtful touches such as lovely Provencal soaps. Aix is filled with restaurants, and although they change often, we are always delighted to return to some of our favourites, and to discover some new ones. Mitch restaurant has been a favourite of ours for several years, and we returned with anticipation on our first night in Aix. Once again, we enjoyed an excellent meal and service at Mitch restaurant, which is located on the Rue des Tanneurs in the old town. A highlight was the pan seared halibut served with a lobster emulsion and cepes mushrooms – excellente! Not far from town, is the hilltop village of Ventabren, which features the tiny Michelin starred restaurant La Table de Ventabren restaurant with a sunny south-facing terrace. This was our choice for Sunday lunch with friends and former neighbours. The setting on a warm and sunny October afternoon was stunning and the meal was superb. Highlights were the scallops with cod mousselline, and the duck plate, which were both beautifully presented and delicious. The only downside was that lunch took 3 hours – although it was a very pleasant 3 hours with good friends, good food and good wine! 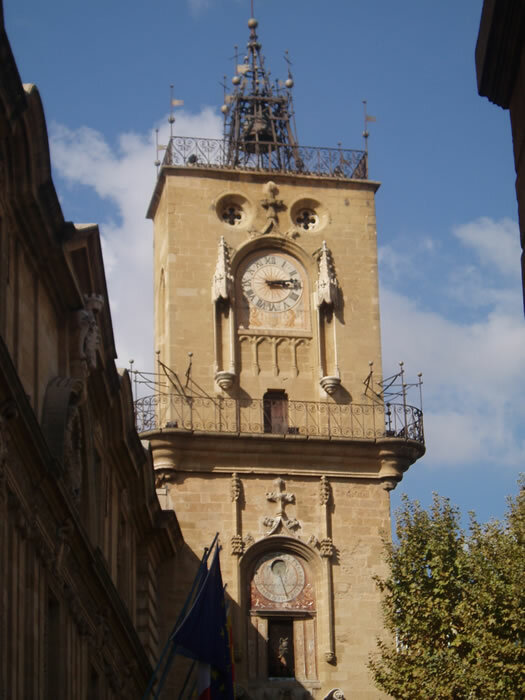 In the old town, just a few steps from the Place Mairie and the beautiful horloge, is the Place des Cardeurs and the restaurant Bistrot des Philosophes. We had a fabulous meal and great service. Our favourite dishes were the starter plate with buratta cheese with pesto, beefsteak tomatoes, duck pancetta, and parmesan crisp. 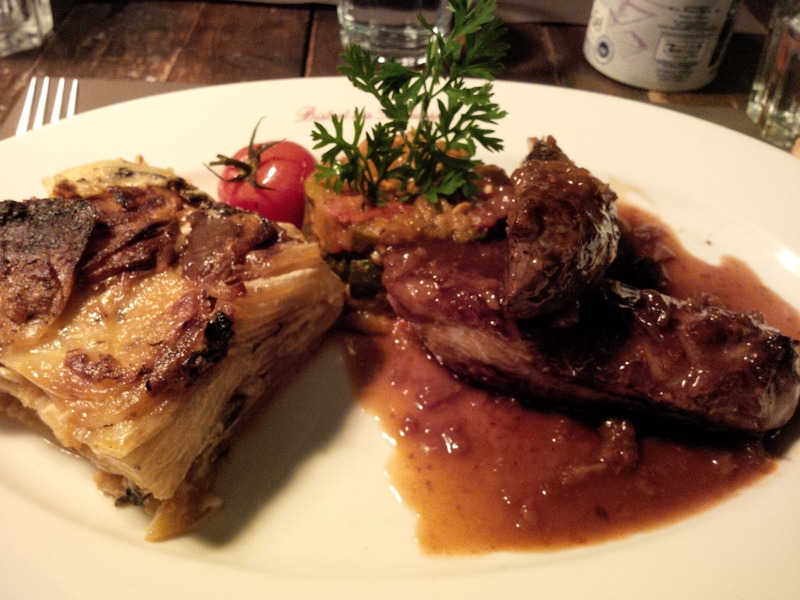 The duck main course was delicious served with a fig sauce, potatoes dauphinoise with cepes mushrooms, and a vegetable tian. 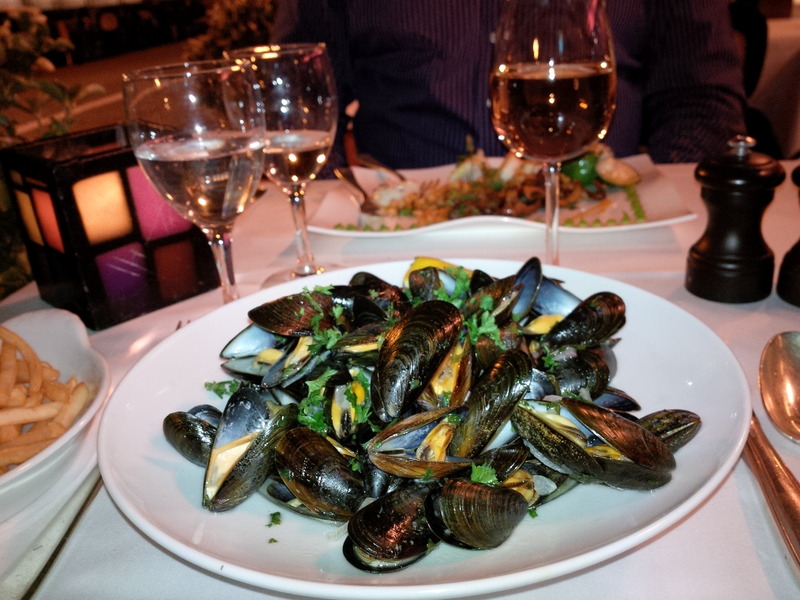 Another favourite and very popular restaurant In Aix en Provence is the Poivre d’Ane on the Place Forum des Cardeurs. 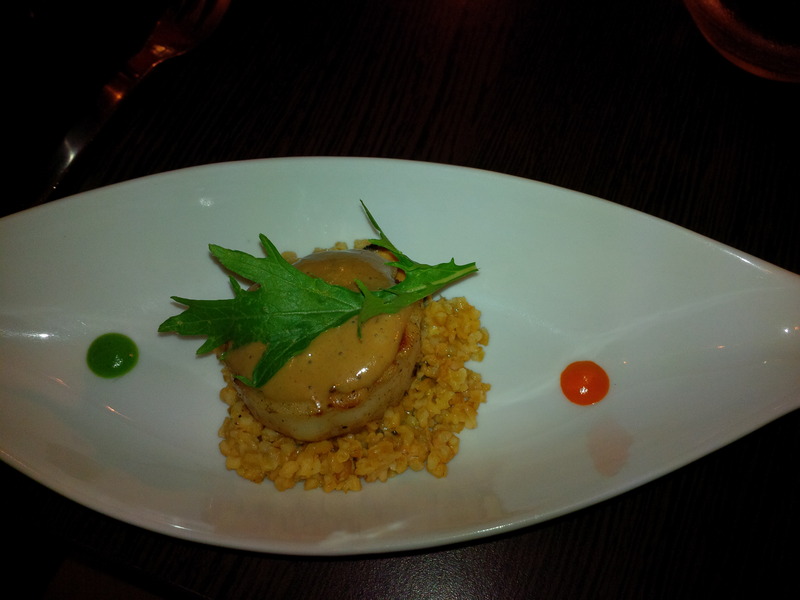 We chose the discovery menu with selections made by the chef. We sampled a foie gras and lobster terrine starter, a fabulous scallop with cepes mushroom sauce starter, partridge with prune sauce, and an incredible tiramisu with pistachio mascarpone, and raspberries – exceptional and highly recommended. The weather was outstanding throughout our stay – beautiful, warm and sunny every day – a real treat at the end of November. As always, we left Aix en Provence with sadness, but look forward to returning soon. 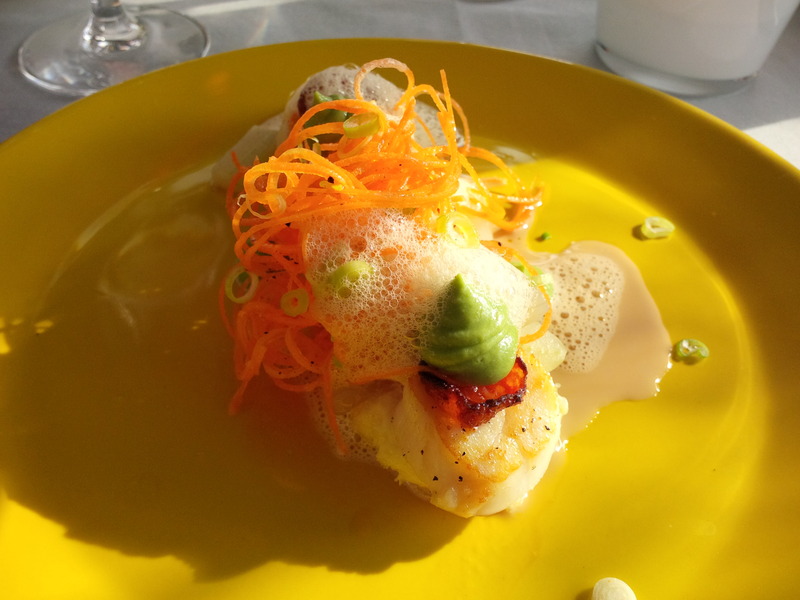 This entry was posted in Activitites, Food & Wine, Villages & towns, Villas & Vacation Rentals and tagged Rental apartments in Aix en Provence, Restaurants in Aix en Provence on October 29, 2014 by franceboundblog. The hill towns of the French Riviera are a delight to explore, especially during in the off season, when even the most popular hill towns such as Eze are quiet. Eze village is a dramatic Medieval village precariously perched on a rocky outcrop towering above the Riviera coast like an eagle’s nest. The ancient fortified village is still crowned with the ruins of its 12th-century castle, and the castle grounds host the well-known tropical Jardin Exotique. The charming village is a maze of steep cobblestone streets and arched passageways, and the panoramic views from over 1500 feet above sea level are breathtaking. Gourdon is another stunning hilltop village near Grasse (40km NW of Nice). From Grasse you can travel the D3 road which winds back and forth through the Gorges du Loup and up a steep ascent to the beautiful village of Gourdon – an unspoiled gem with a spectacular setting clinging to the steep hillside and overlooking the Loup canyon on one side and the countryside and villages to the distant Riviera on the other side. On a clear day you can see from Nice to the Italian border. The village is filled with picturesque cobblestone streets and quaint stone houses, shops, and a handful of restaurants. On such a beautiful day, we chose La Taverna, which has a panoramic view from the large south-facing terrace. We enjoyed a lovely salade chevre chaud (my favourite salad). This version served the chevre cheese bubbling hot on the side of a green salad with tomatoes and croutons. The salad was delicious, and the setting and the view from the terrace were extraordinary. 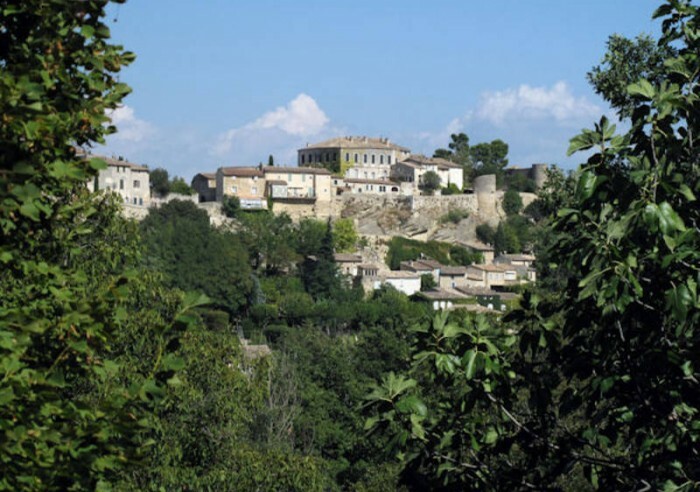 Other hill towns that we have visited in the past and recommended are Tourettes sur Loup, Biot, and Mougins. Tourettes sur Loup is an especially picturesque village with a Medieval core of clustered warm stone houses, most of which are now artist ateliers (workshops), where you can watch the artisans at work and purchase lovely olive wood products, handmade jewellery, and artwork. 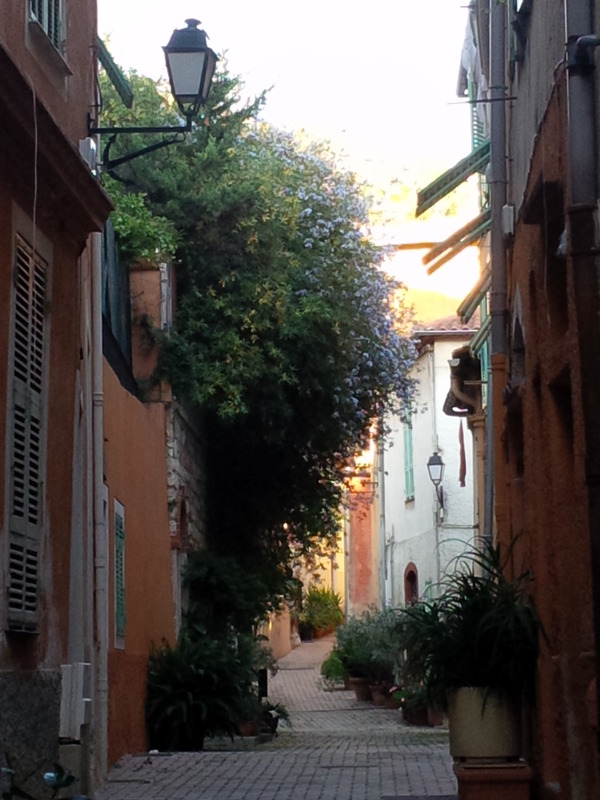 Biot, near Antibes, is known for its colourful handblown glassworks filled with tiny air bubbles. You can visit the Verrerie de Biot to see a demonstration of glass blowing and purchase some of the beautiful pieces, which can be shipped home. 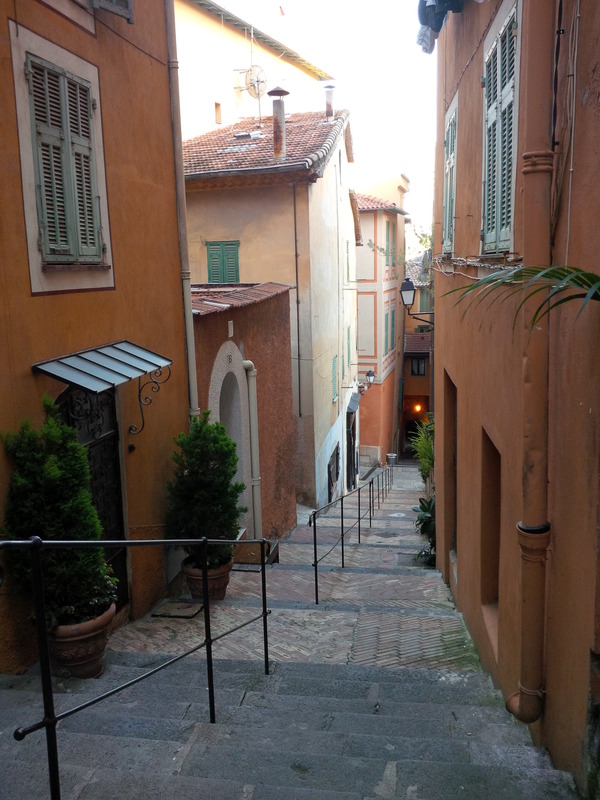 Mougins is a charming medieval village just north of Cannes that has become known as a gastronomic centre. Mougins has a charming pedestrian only centre courtyard with a fountain, lots of flowers, and shady trees, where you can find several Michelin starred gastronomic restaurants. We continued our journey NW into the Var region of Provence and stopped at Lorgues, another lovely village to revisit one of our favourite villas: Villa Lorgues. Lorgues is ideally situated within easy walking distance of the pretty village of Lorgues, which has a weekly market, and several shops, cafes & restaurants. The villa is very well appointed and features air conditioning. Lorgues is ideally located just 1 hour from Nice and Aix en Provence and the Mediterranean coast. 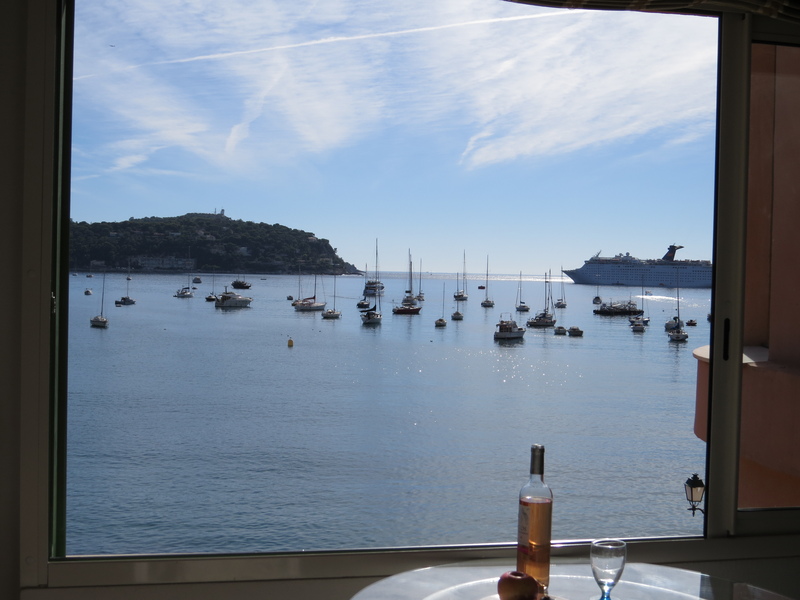 This entry was posted in Activitites, Food & Wine, Villages & towns, Villas & Vacation Rentals and tagged Cote d'Azur, Provence villages, Riviera, vacation rental on October 28, 2014 by franceboundblog. We arrived in Nice at sunset and were met by our friendly English speaking driver Frederic, who whisked us to Villefranche sur Mer where our apartment manager was waiting to greet us. As we entered the apartment, we were thrilled to hear the waves lapping against the quayside just outside the large picture window that dominates our little seaside apartment. After our apartment orientation, we walked along the quayside past the beautifully lit restaurants on the quay and through the cobblestone streets of the village. With a recommendation from our apartment manager, we found a perfect place for a late dinner. Cave Nature is a quaint restaurant and wine bar set in a small square in the old town. They serve a delicious assortment of “tartines” (flat bread or open face sandwiches), such as crab with avocado & tomato, or duck with figs and lettuce, and offer an impressive selection of wines by the glass. It was a great start to our trip, but the real “wow” moment was the next morning when we saw the breathtaking views from our window. 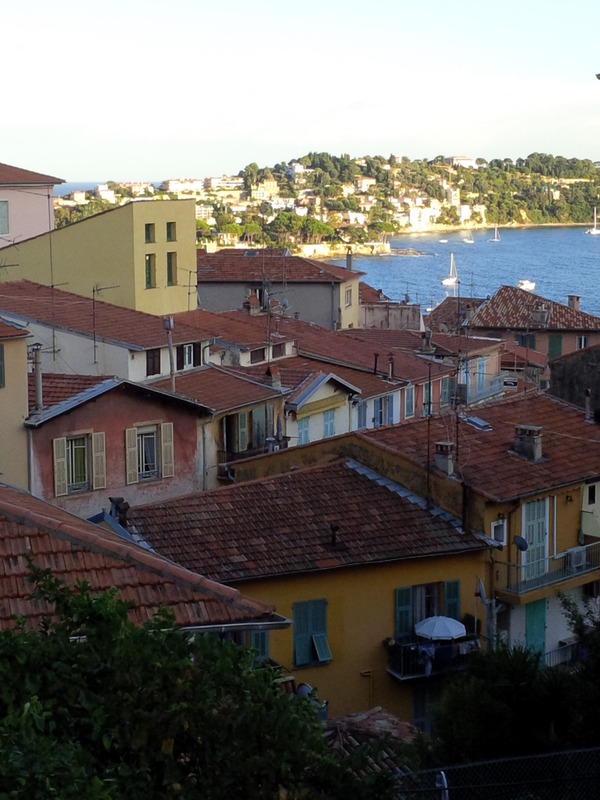 The sun was shining on the ochre coloured buildings, and the incredible azur sea was sparkling just outside our window. Early morning swimmers were enjoying the warm water, colourful boats were bobbing in the harbour, sunbathers heading to the beach, and we were delighted by the incredible views while we enjoyed our morning coffee! 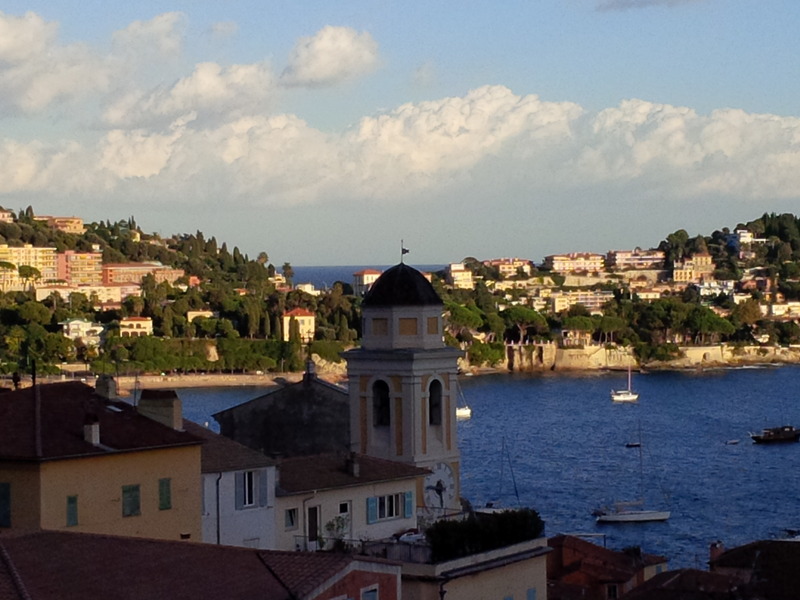 The old town of Villefranche is charming, and has a twice weekly market on Wednesdays and Saturdays. 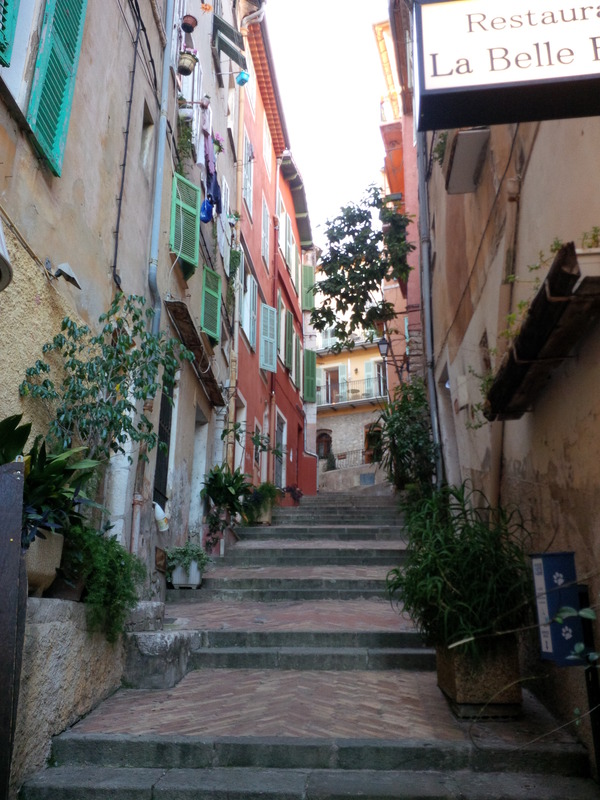 The buildings are painted in warm Provencal colours that are lit by the sun, and the streets are winding cobblestones with lots of stairs leading up the hillside to the newer parts of town. The 16th century Citadel is an imposing and well preserved fortress that defended the village and now houses 4 museums. Also worth a visit are several churches and and art galleries. We tried out several restaurants during our stay, and recommend: La Belle Etoile for dinner in the old town- great food and service; La Mere Germaine – expensive, but fabulous location on the quay and excellent food and service (especially the calamari, sole & scallops paupiettes, & moules marinieres), and the Cave Nature (described above) – great for lunch or a light dinner. 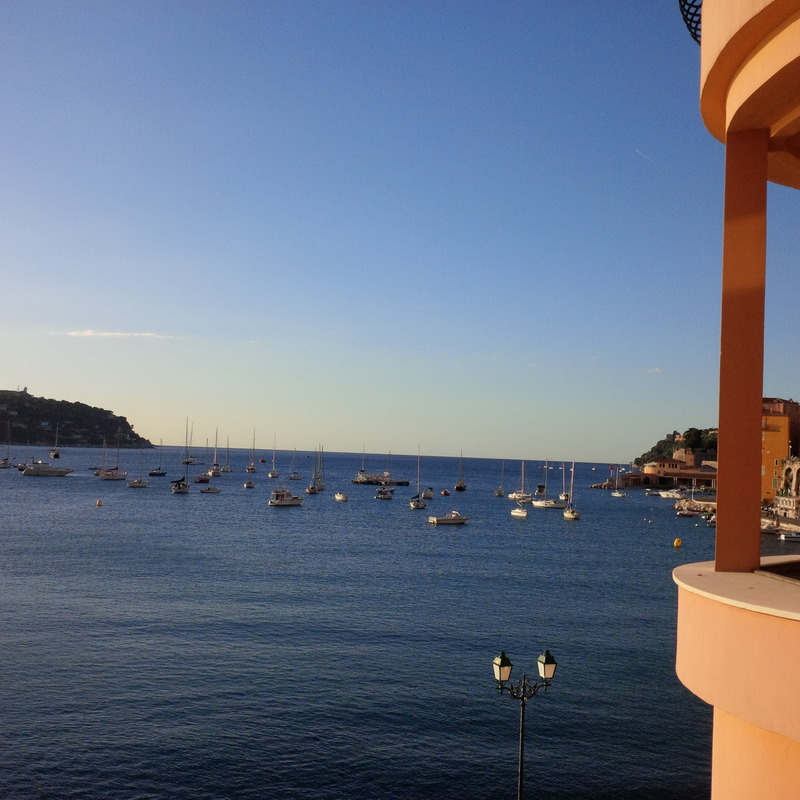 This entry was posted in Activitites, Food & Wine, Villages & towns and tagged Villefranche sur Mer on October 24, 2014 by franceboundblog.